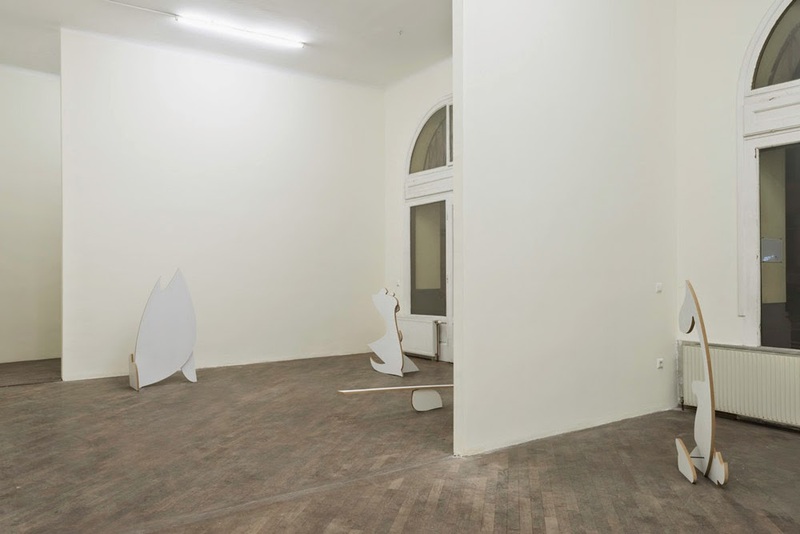 Andy Boot, installation view, Galerie Emanuel Layr, Vienna, 2013. Images courtesy of Croy Nielsen. One thing I’m hearing these days, loud and clear, is the hum of an art style that I like to call Zombie Formalism. “Formalism” because this art involves a straightforward, reductive, essentialist method of making a painting (yes, I admit it, I’m hung up on painting), and “Zombie” because it brings back to life the discarded aesthetics of Clement Greenberg, the man who championed Jackson Pollock, Morris Louis, and Frank Stella’s “black paintings,” among other things…. With their simple and direct manufacture, these artworks are elegant and elemental, and can be said to say something basic about what painting is—about its ontology, if you think of abstraction as a philosophical venture. Like a figure of speech or, perhaps, like a joke, this kind of painting is easy to understand, yet suggestive of multiple meanings…. Finally, these pictures all have certain qualities—a chic strangeness, a mysterious drama, a meditative calm—that function well in the realm of high-end, hyper-contemporary interior design. Andy Boot in “Sunny and Hilly,” a group show at Minerva in Sydney, Austrailia. 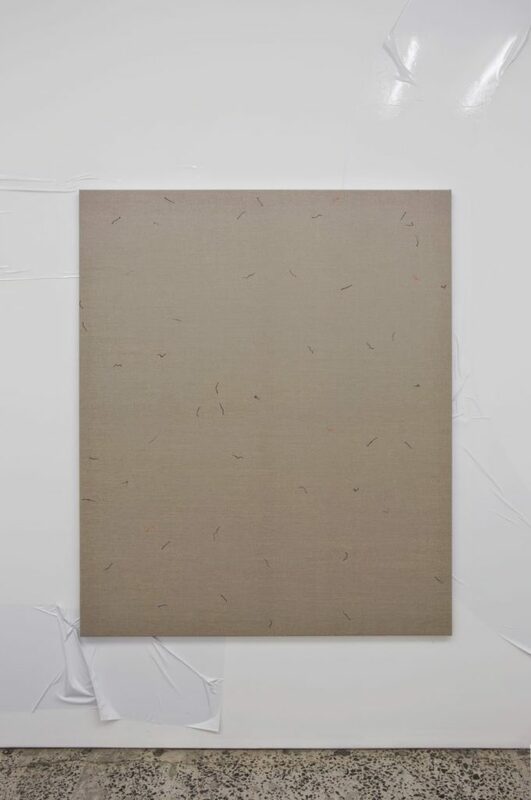 meliorates, 2014, watercolour on canvas, 1600 × 1300 mm. Hany Armanious installation on wall surrounding Boot’s painting. gently appealing to the viewer through a subtle complex of relations…. The ability of a network to bear out sundry relationships is key to the young artist’s heterogenous oeuvre, which consistently brings together mundane objects and mate­rials in a manner which undermines familiar associations, using economical means to expand the frame of reference beyond the simple juxtaposition of high and low. For Boot, the narrative, like the network, already exists; it is the viewer’s relationship to it and the objects flowing in its stream which require reevaluation – a nudge, or two. I don’t know much about Boot, but it seems to me his work is perfect for Stefan Simchowitz’s speculator class. I love that first image. Thank you for sharing!! 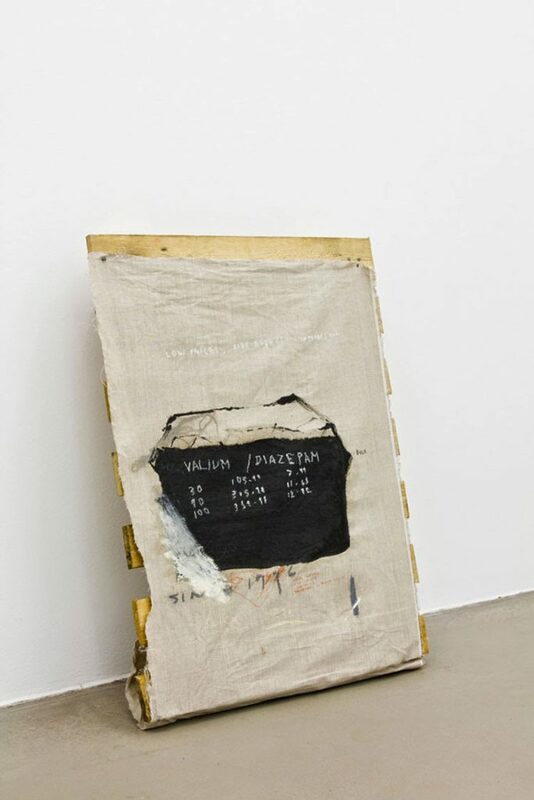 Whatever it's called–"Casualism," the "New Casualism," "Zombie Formalism" (I like Walter's label)–there's no doubt that the "painting" style of the day is marked by a lick and a promise, some sagging canvas and an exposed stretcher bar. Whatever the style is, it's now filtered down to the undergraduate level–and not merely at art schools. I see it in the art department of the liberal arts college where I teach. As deK said, by the time you see the bandwagon it's already too late. R.I.P. Andy Boot isn't New Casualist or Zombie Casualist or any of the other tired terms that constantly pop up on this site. Andy Boot is a young, smart conceptual artist that uses painting as a vehicle or mode for other ideas. 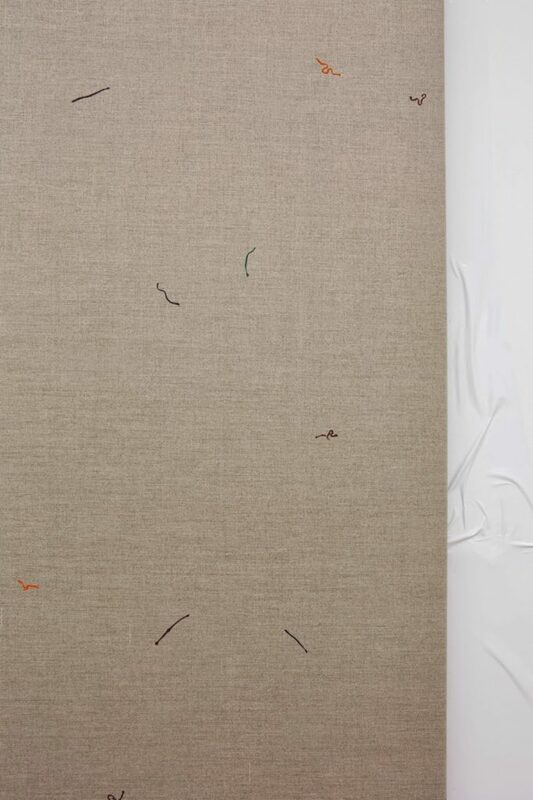 His painterly, abstract gymnastic ribbon pieces in wax from 2012 are genius. His sparse watercolors on linen look like loose fibers clinging to a new sweater, or slinking organisms in a petri dish. If you "don't know much about him", then why dedicate a post to him, and then try to categorize his work as something that should be speculated on and flipped? I used the adjective Zombie in regards to formalist derivative art in Dec of 2013 before Robinson used it.It is different from Casualist art but all under the nihilist rubric.Nihilist is not pejorative.